Have you made socks cuff down and now want to make them from the toe up? 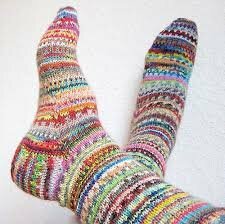 In this six-hour, three session class you will learn to make socks beginning at the toe in the method of your choice. You can choose to use double pointed needles, two circulars or magic loop. Needles for your preferred method: You will knit a swatch to determine the size of needles you need. We will start with 2.25 mm. Requirements: Participants must be experienced and comfortable with casting on, the knit stitch, purl stitch, increasing and decreasing and binding off.